Answering everyone's prayers, the just-announced Nokia Lumia 1020 finally combined the PureView Phase 1 mobile camera technology as found in the 41 MP sensor of the 808 PureView, and the optical image stabilization (OIS) technology of Phase 2, which first appeared in the Lumia 920. These two cameraphone "firsts" are now merged in one and the same device, and with a modern mobile OS to boot. Nokia took the stage to unveil what will likely be the cell phone camera to beat in the foreseeable future. Let's get the boring specs out of he way before we go into the nitty-gritty of the camera unit. Lumia 1020 flaunts a 4.5" 768x1280 pixels PureMotion HD+ AMOLED display with ClearBlack filter and Gorilla Glass 3 on top, so you can expect blur-free visuals, high contrast ratio and low reflection. There is the usual high-brightness mode, which in Nokia's late flagships means the excellent 600 nits, which would aid sunlight visibility. The supersensitive touch tech is present as well, so the screen can be operated with gloves on. The handset, available in black, white and yellow, measures 130.4 x 71.4 x 10.4 mm and weigh 158 g, which makes it thinner and lighter than the chubby Lumia 920, despite all that camera jazz inside, since with Lumia 1020 the wireless charging ability is added via a separate cover if you want it. It's powered by a dual-core 1.5 GHz Snapdragon S4 processor, features 2 GB of RAM, which is double the usual WP flagship amount, and 32 GB of internal memory. The 2000 mAh battery is good for seven hours of video playback and 13 hours of talk time, so it's right up with your typical flagship endurance. Nokia brought over the stereo Rich Recording technology with HAAC mics, which should make for the best-sounding video footage from any phone, judging from the amazing results that came with the 808 PureView. Now the dry specs of the camera - breathtaking 41 MP BSI 1/1.2" sensor, 3x lossless zoom (up to 6x for HD video), six-elements lens with ZEISS optics, second generation OIS suspension for shake-free videos and blur-free low-light photos that can compensate for up to 500 movements a second. The famed pixel oversampling again combines up to seven pixels in one super pixel at the default PureView mode, and can shoot simultaneously in the high-res 34 MP or 38 MP modes, and the PureView 5 MP mode for easier sharing. The oversampling tech now comes to video capture as well, so you get the highest quality footage possible with a phone, even when zooming while you record. Add to those a powerful Xenon flash and an LED light for video recording, and you easily get the best cameraphone on the market, available this month. AT&T is getting it exclusively July 26th for $299.99 on a two-year contract, and you can preorder it starting July 16th. can you explainn 'we' ? Nokia evil???? Care to explain?? Hope Nokia will never go androlag. Explain me one thing. You're bitc^ about Nokia so hard so why are you tearning for its camera? Your samesung has nothing to offer? Hhahaha it has androifd to offer my friend......android is the most advanced OS in the world. Period. is that why Samsung is leaving android slowly and going to tizen most advanced in the world the ui isn't simple there's nothing advanced about it you can call it the most complex in the world that works better also why is the most advanced OS in the world a center where developers lose money and waste time conclusion go go nokia best of luck to you with your new beast ! don´t push with this friend:) it is android but it´s an advantage for you. For me, it´s a disadvantage. What a lame argument. That's total opinion mate. Mr Flop no more Nokia, until this guys is fired. "Exclusively from AT&T" is a big NAH. Windows + AT&T, how much more evil can you get? In a world where Samsung, HTC, and even Apple are pushing their devices across all carriers it's a little disheartening to see exclusivity continue. 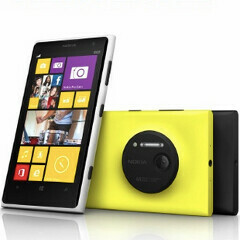 "AT&T* and Nokia announced today the Nokia Lumia 1020 featuring breakthrough PureView camera technology. Available exclusively from AT&T beginning July 26, the Lumia 1020 is priced at $299.99 with a two-year agreement and comes in matte black, matte white and matte yellow. Customers excited to reserve theirs can pre-order beginning July 16 at." The absolute retards... $300 on 2yrs for 2011 specs and a nice image sensor???? Where are you getting 2011 specs from? S4+, HD AMOLED and 2 GB RAM = Galaxy S3. It has an old dual core CPU, 1gigs of ram and Adreno 225, I mean the midrange SD400 blows it out of the water and Nokia charges an extra $100 compared to the current crop of flagships sporting SD600/800, Adreno 320/330, 2GBs of RAM, ~3000mAh battery, 5" FHD screen, microSD slit, IEEE 802.11ac all in a slim design. That's insane. I love a good camera, but that's just ridiculous. I'm not hatin', I looked forward to this. The 2000mAh battery is a reason alone to pass on it, even for $450 retail, but it looks to land for $700. Bone, I don't know how retard you can go. Of course you don't, cause you're retarded... nah joking. I jut have nothing intelligent to say to you. s4+ is old dual core cpu ???? its 10 times better than the s400 found in the s4 mini/zoom and mega 6.3 and if the s4 zoom has a price of 500-600$ price then what would u expect from this supercamera ? ?hd + is and 2gb is 2011???? it seems u r from another world !! Besides a better camera I think $300 is a steep price! And it does have 2011 specs. They could have at least increased the battery which is a real bummer.